If your pond isn’t up and running yet, now is the right time to get it going. Here are the basic steps you should take to make it functional again. Undo all of the things that you did to the pond last winter so you can get it back in shape for the warmer months. This means turning the pump back on if it was off, and refilling it with water if you drained it. If you’ve got a koi pond, start feeding your fish with cold weather food until the temperature of the water reaches 60 degrees, then you can continue your normal feeding schedule. Use a skimmer to remove debris and leaves from the pond and use an algae eating product to clean up anything that has accumulated throughout the season. A pond vacuum is also ideal for cleanup of the bottom of the pond. It can reach sludge that is harder to reach with other cleaning products. This can be done with the fish in a separate pool of water. Do not use chemicals in the water, especially if you have fish. This can become harmful to them and to the environment. Add and fertilize plants inside the pond as needed. You want to do so according to their specific schedules, depending on what type of plants they are. Clean your filter out, as needed. 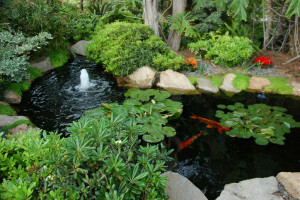 Summer is also a great time to keep up with the maintenance of the pond and fish within it. Don’t forget these important aspects of pond maintenance in the summer time. Regularly remove any dead foliage from the pond using a skimmer and other cleaning tools. Remember to fertilize the plants as often as necessary, according to their directions. Clean your filter, as needed. Remember to feed your fish daily, but do not over feed them. Use a pump to provide the water with aeration to keep the plants and fish alive. Continue to use products for algae and bacteria inside the water. Don’t have a pond, but want to add one this year? Consider these pond basics. If you need a little extra help this summer with your pond maintenance, speak with us here at Architectural Landscape Design. We offer residential and commercial landscape maintenance packages that include water features such as ponds. And if you don’t yet have one but you’re thinking about having a pond installed this summer, this is also a great time to call us for a free in-home consultation. We’ve got lots of ideas we can go over with you.